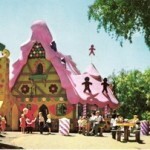 Santa’s Village were the first franchised theme parks in the world. There were two Santa’s Villages in California 1950s & 1960s – today they are both closed. One was near Los Angeles, at Skyforest, near Lake Arrowhead in the San Bernadino Mountains. The parks sat on fifteen forested acres, eleven colorful buildings housed Santa Claus and his toy workshops. It was a fairyland setting for his gnomes, elves, Gingerbread kids and little animal friends make up a children’s and grownups’ paradise the year round.” A REAL Gingerbread House, where a Good Witch bakes Gingerbread every day. Visit here for more information and spectacular photos on this vintage theme park.